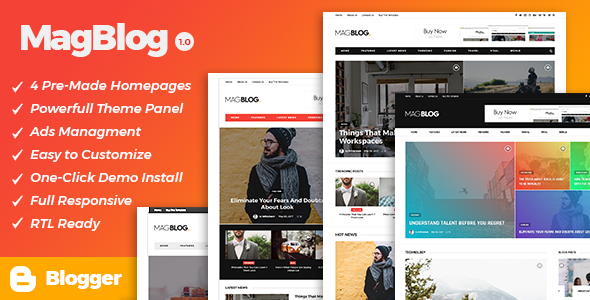 Description: MagBlog - News & Editorial Magazine Blogger Templates is a clean, elegant, user friendly, fast-loading, customizable, flexible, functional, fully responsive and excellent for a news, newspapper, magazine, tech, publishing and review site. So far, It uses the best clean SEO practices, and on top of that, it’s easy to use and to setup by One-Click demo install. The MagBlog offers many amazing features, each added in order to enhance your web page. It manages to balance power and beauty, resulting in a high-quality browsing experience for all users. Many sites have to choose between complexity and accessibility, given that their layout cannot adapt to the diminutive screens of hand-held devices. Thankfully, MagBlog theme has solved all compatibility and resizing issues. Customers who prefer smart phones or tablets can now access your posts with ease.